At the close of 2014 the Greer Family donated a remarkable piece of Pennsylvania Railroad history in the form of an oversized album of large format photographs made by Frederick Gutekunst (1831-1917) a native of the Germantown section of Philadelphia. Operating out of a studio at 7th and Arch Streets for more than 50 years Gutekunst was considered one of the preeminent photographers in the post-Civil War era. Some of his subjects included noteworthy people like Thomas Eakins and Walt Whitman but also extended beyond portraiture to include architecture and the built environment of the PRR. Before this album surfaced most examples of his work were in the form of stereo views, making this collection of 16x12” large format prints incredibly rare. The portfolio, dating from ca. 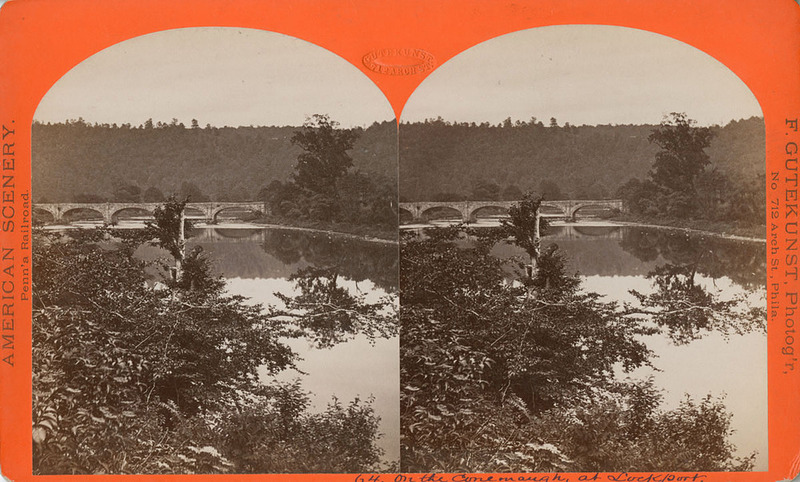 1875, titled simple “Scenery of the Pennsylvania Railroad” represents one in a series of campaigns the PRR embarked on to celebrate the railroad as a destination, touting the freshly manicured railroad dissecting the wilds of Pennsylvania, following serpentine rivers, paralleling the canals the road made obsolete; a symbol of modern engineering and progress in America. Fittingly the railroad chose photography over traditional illustrations and paintings, providing a tangible image which potential travelers could connect to, a portal into the world of the PRR and the landscape it traveled. Like his contemporary William H. Rau, Gutekunst utilized the large plate view camera to portray the growing railroad as the country recovered from the American Civil War. This remarkable portfolio illustrates the Pennsylvania Railroad before the grand system improvements started under Chief Engineer William H. Brown and his successors, which would last from the late 1870’s well into the first decade of the 20th Century. On the Conemaugh at Lockport, Pennsylvania, by Frederick Gutekunst. Up until the PRR portfolio surfaced, much of Gutekunst's work for the PRR was only known to exist in stereo views like this. Image collection of Library Company of Philadelphia. What makes this donation even more special, especially to PRR preservationists is that we owe a great debt of gratitude to a former Pennsylvania Railroad employee for having the foresight and pride in his employer to save the portfolio. David St. John Greer, was born in Philadelphia in 1914, his father a laborer and his mother a seamstress. Settling in New Jersey, David completed high school in Pemberton, NJ and enrolled in a 4-year business administration program at Drexel University. Graduating from Drexel in 1937, Greer would begin a 32-year career with the Pennsylvania Railroad. Though the details of his early years with the company are limited, in 1943 despite being exempt as a railroad employee to serve during WWII, he felt compelled to serve his country and enlisted in the Navy. Greer was never deployed in active war but was appointed as the Assistant Supervisor of Exports for the PRR Port of Philadelphia and later served as the District Property Transportation Officer in the Port of Philadelphia Customs House while also acting on the Ports Conditions Committee. Greer was released from active duty in January of 1946 as a Lieutenant returning to his civilian job with the PRR. Over the next 11 years Greer worked all over the system as a Supervising Agent for important terminals like Williamsport, Harrisburg, the company piers of New York, and Philadelphia. In 1953 he was promoted to Superintendent of Stations in the Pittsburgh Region and later the Chicago area from 1955-57. By the end of 1957 Greer was promoted to Manager / Director of Freight Stations and Motor Service on the entire system, responsible for all stations and trucking companies owned by the PRR. In 1968, the fateful year long time rivals PRR and NYC merged Greer was appointed Director of Stations system wide where he served just one short year, deciding that he could no longer work for the merged railroads. David St. John Greer, pictured here in the center of the middle row (dark suit) was a devoted Pennsylvania Railroad employee who purchased the Gutekunst album after the ill fated merger of the PRR and rival New York Central in 1968. After being in their possession for over 45 years the Greer family decided to donate the album to the Library Company of Philadelphia where it will join a sizable collection of Gutekunst's work along side the William H. Rau commissions for the PRR. Image courtesy of the Greer Family. Survived by his daughter Ann Hiros and son David Greer, David St. John Greer passed in December of 1993, leaving the album among other items with the family. In late 2013 I had heard about the album surfacing through PRRT&HS archivist Charlie Horan and in March of 2014 had the pleasure of meeting David on a train trip to Pittsburgh riding the Juniata Terminal Company PRR 120 and the Warrior Ridge (A Ride on the Pennsylvania). Dave expressed his interest in donating the album to a place that not only could care for it properly but also make it accessible to the public. Given my experience with the Rau collection housed at the Library Company of Philadelphia I suggested that David consider the institution, not only because of Gutkunst’s Philadelphia connection but also because of the existing collection of his work already at the LCP. It would also bring together two very important collections of photography that focused on the Pennsylvania Railroad from the 19th Century. At the close of 2014 the Greer family ultimately decided the album belonged in LCP’s permanent collection, adding to an incredible archive of 19th Century prints and photographs. We are lucky to have this resource preserved where it will ultimately be digitized for many future generations to enjoy in the honor of David St John Greer and photographer Frederick Gutekunst.